Packed and drove to Radisson Hotel by the Airport. A little difficult to find. Almost clobbered a motorcycle when I had to change lanes at the last minute to make my turnoff. Guy was in a hurry, passing on the right. Anne bought a case and a half of micro-brew beer, in bottles, for her brother. No problem, just wrap it up and ship it as luggage. We each get two bags and we are only taking one a piece. Lay an old sleeping bag over a duffel bag that my brother Andy left us. Set the two boxes of beer on the bag, wrap them up in the sleeping bag, and zip the giant duffel bag closed. Great, it all fits. It is a little heavy. Are we going to meet the weight restrictions? Well, no, we are not. The bag weighs 56 pounds, and bags over 50 pounds net a 50 dollar surcharge. Okay, so we have to open it back up, pull out the smaller box and pack it in another bag. Okay, now we are under the weight limit. We stay at the hotel because they offer free parking while we are gone, and because we do not have to get up at some ungodly hour and drive to the airport. We still have to get up at an ungodly hour, but it is a little easier to get ready, because we have already cut our ties to the house. No trying to figure out if we forgot anything. All we have to pack is the stuff we brought with us. Does what we save on parking pay for the hotel room? Maybe, I don't know. The hotel has fancy numbered beds. Supposedly you can adjust the firmness of your mattress by pressing these buttons on the remote control. I could not detect any difference. The remote was a bit of a pain to use. Press the up button to increase firmness and this motor starts running and making noise and the numbers on the display increase. Okay. Press the down button and nothing apparently happens. Hold it down for a while and then let up and you get a new, smaller number in the display. I tried running it up to 95 and then down to 35 and I could not detect any difference, until I tried to get out of bed. Then I noticed there was a padded rail at the edge of mattress. The center of the mattress had sunk below the edges. I think I probably should have boosted the pressure a bit. Later on I could hear the neighbor running their mattress pump. Loud and obnoxious. All the outlets were in use, so I had to unplug something so I could plug in my CPAP machine. Why are outlets in hotel rooms always in the most inconvenient places? They always seem to be behind the mattress or the dresser. Seems like the room designers could do a better job of this. Anyway, I got the machine plugged in and then it quits. What's wrong now? Well, the outlet is loose. If you the jiggle the plug, the machine turns back on. Seems having a plug in the socket and then jamming the mattress against has damaged the outlet. Big surprise. Get it working and leave it. It continues to work, thankfully. The shower had a large diameter head. The flow was adequate, but the force was not very high. It was weird, when I let the water run on my face it tickled my lower lip or something. I couldn't quite figure out what it felt like exactly. It did not hurt, but I could not stand it either. Could not let it run on my face for more than a second or two at a time. There was a tissue dispenser under the sink, but it only had two or three tissues and was soon empty. There used to be a card lock on the outside door, but it was gone. There was a track of something gross on the parking lot outside the back door where a garbage bag had dripped on the way to the dumpster. Turns out we were lucky to have a room. All the hotels in the area were full because of the Grand Opening of IKEA tomorrow. Anne had booked our room weeks, if not months, in advance. Many any years ago when I used to ride a motorcycle, I always found it disconcerting how much the front end of the bike would sink down when I applied the brakes hard. After some thought on the matter I realized a link connecting the front brake caliper to the steering head could help alleviate this sinking feeling. The caliper would need to be mounted to the axle and free to rotate around it. It would be mounted behind the front fork, that is, to the rear of it. When the suspension is compressed, the link would cause the caliper to rotate around the axle towards the bottom of the disk. Conversely, when the suspension was extended, the link would cause the caliper to rotate towards the top of the caliper. Applying the brakes would cause the caliper to try and rotate in the direction of the forward rotating disk. This would exert an upward pressure on the link which would counteract the downward pressure of the front of the bike, keeping it from diving so far down. Some experimentation to determine the length of the link and radius of the link connection point will be in order. I supposed an illustration is in order, but I have not learned to use a computer drawing program that would allow me to produce a drawing as quickly as a pencil. And pencil sketches, well, they would have to be scanned, and then they would require some fiddling. Someday I may get around to that. But back to the topic at hand. Some time later I observed that when a car comes to a stop we have something of the same phenomena. It is not nearly as disconcerting, probably due to the seating position, but there is one thing that bothers me, and that is the way a car sets back on it's springs after it has come to a stop. It should not do that. When it comes to a stop, it should stop completely, it should stop moving. It should not be moving around on it's springs. With all the fancy schmancy technology they are trying to pack into cars these days, let us see if the automotive engineers can solve this puzzle. I can smell the hype now: "Anti-dive brakes, the ultimate in braking refinement". A made-in-Russia espionage thriller! I can't remember the last time I saw a movie made in Russia, oh wait, maybe "Archangel", another thriller. But "Mirror Wars" was made by Russians. It was not too bad, not too good, but not too bad. It had several well-known English language actors, but for the most part it was dubbed. I really do not like dubbing. You lose so much from the tone of voice. I much prefer to hear it in the original language and read the subtitles. I think they worked really hard on the dubbing, because I did not notice any discrepancy between their lips and the words you were hearing. However, it often made for very odd pacing of their lines. I wonder about the English language actors. Did they speak their lines in Russian originally, and then dub over them? Or did they speak in English to Russian actors who responded in Russian? The plot was complex enough to be interesting and there were a couple of unexpected twists. The two cops sent to investigate made an interesting pair, the girl was pretty, there were a couple of spectacular explosions. The gun fight staging was feeble. Watching the jet aircraft was enjoyable. I am not sure why that should be, but it was. It was shot in a number of locations. I think they could have made more of that. Sometimes it was difficult to tell if you were in London or Moscow, Siberia or Pakistan. I have taken to doing the Jumble word puzzle on the comics page each morning. Some mornings it goes fairly quickly, some days I am stumped. I will eventually solve it, but I will have to leave and let it pergelate for a while before I come back and make another attempt. Unscrambling the five letter words are fairly easy for me. The six letter words are another matter. Some of those can be real stinkers. Crosswords are impossible for me. The only crosswords I have ever had any luck with are the ones on the back of the kid's menu at Elmer's restaurant. The ones in the paper are impossible. I have tried crosswords before, diligently worked through both lists (Across and Down) and gotten three words, if I am lucky. Often I don't get any. So I have given up on crosswords. My friend Jack and my mother-in-law Audrey will sit down with the New York Times crossword and do it in ink. Lately I have playing "Series of Tubes" and "Planarity". I like them because they have a definite solution and I can work them out in five or ten minutes. Of course how long it takes depends on what level you choose. The level in "Series of Tubes" can be set between 8 and 300. I like level 258. It has a large enough field to be interesting, but the because the field ends at the edges, it is much easier to solve. On some levels the playing field wraps around the edges. That is, you have a rectangular playing field and symbols at the right hand edge of the field may connect to symbols on the left hand edge, as though the playing field were a cylinder and it has been unrolled so you can see the whole thing. So on some levels the field wraps around from one side to the other, on other levels it wraps from top to bottom, and on some levels it wraps around both ways. These are much more challenging. I like level 258 because it is easy, it does not wrap. Planarity looks very different from "Series of Tubes", but it is similar in that involves unscrambling a scrambled mess. I am not sure how high the levels go, but if you go much above 12 your solution is liable to end up crowding the edge of the board, and will have to move everything you have done away from that edge to give yourself room to finish. All this moving has to be done piece by piece, which is a bit slow and tedious, since you are not really making any progress in the solution. I was playing Cubox (the link seems to be dead, and no one else seems to carry it) for a while, but it got to be frustrating. Sometimes I could see the solution and solve it instantly, other times I would fight with it forever and still not get a solution. You can just point and click and eventually you will end up with a solution, but they tell you the number of moves required to solve the puzzle, and it is very low, like 4 or 5, and I think, I should be able to do this. And sometimes I could, but sometimes I could not. What was worse is that I would come back later and try to solve a puzzle I had solved easily and find I could not. Bizarre. I really need a new game. I saw a boy trying to ride a skateboard this evening while I was walking up at Jackson Elementary School. He was only three or four feet tall. The skateboard he was trying to ride was a bit unusual in that it only a single wheel in front and a single wheel in back. I had seen them before, but had not a chance to study them. The front and rear portions of the board can tilt independently from side to side. The single wheel is a caster, so tilting the board causes the caster to swivel and board to therefor change direction. Normal skateboards are propelled by pushing off against the ground. This board is propelled by (I assume) some trick of wiggling the feet and/or shifting your weight. The boy was struggling with this board, but he was making some progress. I saw him get the board to go about ten feet before he had to step off. One of the big innovations in automotive suspensions in the last fifty years was the introduction of the anti-sway bar, or sway bar in common parlance. This device is designed to keep a vehicle more nearly level when it goes around a corner. Most automobiles have one in the front suspension, some sportier cars also have one in the rear. When driving a four wheeled vehicle, such as a Jeep, off the highway, i.e. on surfaces that are not paved, you want to keep all four wheels in contact with ground as much as possible. An uneven dirt surface does not offer as much traction as a smooth paved surface. The anti-sway bar, and the stiff chassis of most modern vehicles combine to make it difficult to keep all four wheels in contact with the ground when the terrain is uneven. So we have a conflict here. For highway use, we want a stiff chassis that does not roll much. For off-road use, we want a suspension that will keep all four wheels in contact with the ground. My idea is to connect the front and rear axles with an anti-sway linkage. Current anti-sway bars work by causing both wheels on one axle to move together. When one wheel goes up, the sway bar exerts pressure on the other wheel to move up. My idea is to couple wheels diagonally. That is, when the left front wheel is forced up, my cross linked sway bar would exert an upward force on the right REAR wheel. Likewise, when the right front wheel drops down, a downward pressure would be exerted on the left rear wheel. If you visualize a vehicle with solid axles (like a Jeep, or a heavy duty truck), when the front axle tilts one way to accommodate the terrain, the rear axle would tilt the other way. In off road situations, this would help keep all four wheel in contact with the ground. On the highway, it would act like a pair of conventional sway bars. A further benefit would be that tend to keep a more upright position when traversing uneven terrain. The cross linking of the axles means that attitude of the vehicle would not be following one axle more than the other, its' position would be determined by the average of the position of the two axles. Constructing such a suspension for an existing vehicle would take some talented engineering. Using an all mechanical solution of bars, links and torsion springs would have the advantage of being reliable, but would no doubt be difficult to construct around the existing frame and suspension. A hydraulic system might be easier to install, but would need careful engineering to be reliable. Either system would need extensive testing before it could be sold. It would need to be tested off-road to see whether it did if fact help vehicles negotiate uneven terrain and whether it will hold up to off-road abuse. It would also need on-highway testing to ensure that it did not adversely affect the behavior of the vehicle, especially in emergency situations. We have too much stuff. And it is not just me, it is the whole country. We have gotten so good at making things that we will buy a new one just to avoid having to clean an old one, or even worse, just because we are tired of the old one and want something new. Nothing wrong with that, it helps keep the economy going, but it leads to accumulations of stuff, and eventually someone is going to have to dispose of that stuff. Useful stuff you can sell, or give to Goodwill. Eventually though everything wears out and will have to be disposed of. I mean there are things that even Goodwill will not take. I suggest we put a garbage tax on everything sold new. Everything: food, houses, cars, clothes, furniture, do-dads, knick-knacks, whatever. The tax rate would be very low, maybe one percent, maybe less. The money collected would be used to pay for garbage collection, sewers and recycling. Businesses could bid on providing these services. Companies that do a better job of disposing of stuff could make more money. Dumps, instead of charging people, would pay people to dump their stuff there. Fringe benefit would be no more illegal dump sites, or least fewer. Why dump your trash by the side of the road when you can collect money for it at the dump? I heard that some places in California (naturally, all the wacko ideas start in California) do not have separate recycling bins anymore. People dump everything in the trash containers and then garbage collection people sort the recyclables from the garbage. On one hand it sounds bizarre. Seems like it would be easier to deal with if it was sorted to begin with, but then there are people who cannot be bothered to separate the recyclable stuff from the garbage, or do it incorrectly. And then there are cases, like we had here in Oregon, where a whole bunch of stuff, some kind of plastic I think, was accumulated from our recycling program, but it ended up going to the landfill because there was no market for it. How many man hours went into recycling that plastic? First, the consumer has to separate it. Then the garbage collection company has to keep the plastic separate and then it has to be stored. A great deal of handling for something that turned out to be worthless. Recycling only works when you can produce vast quantities of a material that there is a market for, and it only pays when you produce that material for less than people are willing to pay for it. Recycling can work, even if it does not pay directly, as there can be mitigating factors that our current business rules do not cover. Things like not sending material to the landfill so that it does not fill up as fast. Or using recycled material instead of new generates fewer emissions into the atmosphere or water. I think we need a garbage tax levied on all new materials when they are sold. The ads looked promising, like they always do, but the movie failed to deliver. Sandra Bullock, old as she must be, is still very easy on the eyes, so there was some compensation. It starts out being a little creepy, first her husband dies, then he isn't dead. It goes back and forth like this a couple of times and just enough clues accumulate to make you think that maybe this is a conspiracy to drive her crazy, but no, that is not the case, her days are just mixed up. She experiences Wednesday before Tuesday, Friday before Monday, or something like that, I couldn't keep it all straight, and it does not make much difference, because even though she knows what is going to happen, so goes ahead with the script, and in the end "fate", or stupidity, or a dumb screenwriter steps in and gives us what we already know happened. Of course, they pump it up with all kinds of reasons why it should not happen. Total claptrap. The whole point of establishing a base on the moon is to set up a factory for making parts for a space habitat at the Lagrange Point L4. A habitat is going to be a very large construction project, just the launching of all the material into a lunar orbit is going to be an enormous undertaking. We could use rockets, but there may be a better way. Build a magnetically levitated rail line. Have a single car large enough to accommodate the largest item you are going to want to launch into orbit. Accelerate the car to something greater than orbital velocity, and release the item. It will float upward into orbit around the moon. It should be no great shakes for a small rocket to boost it from there up to the Lagrange point. Build a magnetically levitated rail line. That sounds simple enough, we have done that here on Earth. If we can do it here we should be able to do it on the moon. Stands to reason, eh? Build a magnetically levitated rail line that can propel a car to 3,000 MPH, which is roughly how fast you would have to go in order to put something in orbit around the moon. That might be a bit of a challenge. We certainly are not going to do that here on Earth, wind resistance might be a bit of a problem. Keeping the car from incinerating might be a bit of a problem. On the moon, there would be no air resistance, so that would not be a problem. Still, getting a device like this to go this fast could be a bit of a trick. How long would this rail line need to be? If you could accelerate at one gravity (32 feet per second, per second), it would take almost 60 miles to reach orbital velocity. At this point you are travelling about one mile per second, so you don't want to delay releasing the payload. Every second you delay you consume another mile of track. And then you would need as much or more track to slow down. And let us not forget that the weight of the payload goes down as we accelerate, although at one gravity of horizontal acceleration, the downward force of the moon's gravity is only small part of the force acting on our maglev rail car. When we finally reach our release velocity, the weight of the payload, and the whole car for that matter, will be negative, so the magnetic levitation at this point will need to be working in the opposite direction, holding the car down instead of supporting it. The supports for this rail line are going to need to be more sophisticated than the rail line itself. Maglev operates with a clearance in the neighborhood of an inch. I have no doubt we can construct a line that will be straight enough for a maglev rail car to work, but how long will it stay that way? Thermal expansion and contraction, shifting of the moons surface, moon quakes, the stresses imposed by accelerating many ton payloads will all try to deform a rail that needs to remain perfectly straight. Okay, perfectly curved, as it will be following the curvature of the moon. The supports will need to be self aligning, allowing shifts to the left and right as well as up and down. Further, they will need to let the rail float in the direction of travel to allow for thermal expansion and contraction, but when it is launch time, they will need to clamp down to provide something for the rail car to push against when it accelerates and when it brakes. And what kind of effects is the launching itself to going to have? Will the rail itself stretch? Heat up? Deform? A great deal of experimentation will need to be done before we start building this maglev launcher on the moon. Normally I don't go for horror movies, but recently I have taken to watching a few zombie flicks. Last year I watched "Resident Evil" with Milla Jovovich, a very pretty woman. Not much of a film, it was adapted from a video game, for Pete's sake, but entertaining enough. Recently I rented "Shawn of the Dead", a "Romantic Comedy, with Zombies". It starts out with Shawn getting up in the morning and going to work, and most of the people he encounters look like zombies, even though nothing has happened yet. Overnight the zombie virus attacks, and the next morning finds Shawn stumbling through his morning routine completely oblivious to the fact that the people acting like zombies, which is their normal mode of behavior, really are Zombies! It was great fun. Ross has taken a great interest in film, which eventually brought him around to Zombie movies. We watched "Dawn of the Dead" the other day, and last night Johnny and I watched "Night of the Living Dead", the original from which all others have been drawn, as near as I can tell anyway. One of the things that always bugged me about horror films is the stupid people doing stupid things, not taking care of business, and getting whacked for their carelessness. That always bothered me. I like James Bond movies, where the hero always does what needs to be done just at the right time. No stupid moves, even the bad guys are cunning. They are fantasies, and I enjoy them. Horror movies are more like real life, full of stupid people doing stupid things. People who are afraid, people who are paralyzed with fear, people who make bad decisions under pressure. Some horror movies are based on real, very horrific, events. This may be why I enjoy Zombie movies, they are not real, except possible in an allegorical way. They are fantasies, grisly, horrific, but with no real basis. I seem to having more than my share of problems with paint this week. Last Spring, when we were getting ready for the neighborhood garage sale, our little red wagon bumped into the front bumper of our brand new car leaving a short red mark. Someone who knew what they were doing probably could have rubbed it out and left it looking like new, but I thought I could fix it and I am afraid I made a mess out of it. I took into a local body shop yesterday and they could fix it, no problem, just $500 to remove, repaint and reinstall the bumper. The estimator had what appeared to be a very sophisticated software package that had exploded diagrams of all the parts of the car, even our relatively obscure Mitsubishi. It took her no time to figure out exactly what operations were needed to separate the bumper from the car and all it's auxiliary fittings. We bought a new suite of furniture for our living room several months ago. Sometime later someone had school project involving poster board, glitter and glue that they constructed in the kitchen. They used a coffee table book to weight it down while t the glue dried. When the glue was dry, the coffee table book went back to the living room. Sitting there it was fine, but it got pushed across the surface of the table, probably to make room for something else, and when it did, it left little tiny scratches in the surface. Evidently "the project" involved not only glitter but some kind of grit, or maybe glitter is gritty. I cleaned off the back of the book, no significant damage there, I got it out of the bargain bin at Barnes & Noble, but the table had several nasty looking scratches on it. I went to Home Depot and picked up a colored wax pencil used for fixing scratches and dents in woodwork and I tried it on the coffee table, but no luck. It did not appear to make any difference at all. Maybe I should describe these scratches better. They look like thin white lines about twelve inches long. If the furniture was lighter colored you might not notice them, but it is very dark. I did some reading about this and one source mentioned that for the last umpteen years all wood furniture for the home is finished with lacquer. Understandable. Lacquer is cheap, dries quick, and gives a very high gloss. That is the same thing that the builder used on our kitchen cabinets and it is slowly turning to gum. That is another problem I will have to deal with eventually, but it isn't even on my list right now. Anyway I made a couple of phone calls and I found a guy who is fixes stuff like this. He'll come out to the house and take care of it, if he can, for $200. If he has to take it back to his shop and strip and refinish the entire top, it will be $400. He is very busy. We hired a contractor to finish the attic above our garage. Some framing, wiring, insulation, drywall, spackle, texture, paint, doors and trim. A lot of work for a very small room. Anne had some wall paint she wanted to use, but it wasn't quite enough, so she went back to the paint store and picked up another gallon, same paint store, same color, same brand, and, supposedly, the same number. But after it dried, it looked different. Oh, look, the number on the can is 3356, not 3456. It is semi-gloss, not satin. I have to look at the right angle to notice the difference, and it is only Johnny's rat hole, is it worth making a fuss about? I am not sure why we didn't just paint it white, but then I am just a man, and what do I know about paint? You may have heard that Ruthless Rupert Murdoch is trying to buy Dow Jones. Dow Jones owns the Wall Street Journal, so if Rupert succeeds in this take over he will own all the newspapers in the world! Okay, so I exaggerate a bit, but according to Professor Ben Bagdikian, we are all doomed. This guy has been writing about the conservative consolidation of the media for the thirty years it has been going on. There used to be a zillion independent newspapers and TV stations and now there is only Rupert. And Rupert backed Bush. No wonder we have a moron for President. Where were the democrats back in '77 when we needed them? Out getting their hair styled. On the other hand, according to http://www.cluetrain.com/, the old style media is obsolete and going away fast. The Internet is taking over, and pretty soon everyone will know everything and all the criminals will be locked up and all will be roses and posies and joy forever and ever amen. Right. All it takes for evil to succeed is for men of good will to do nothing. Sometimes I wonder about chopsticks. I mean, are they better than silverware? And what do you mean by better? They are certainly easier to make, at least if you have access to some wood and can handle a knife. But then they don't last very long. Most wooden chopsticks get thrown out after one meal. But wood is organic, so it will break down and decompose. Or they could be used as kindling for a fire, should you need a fire. And almost everyone needs a fire of some sort. Silverware lasts for practically ever. All you have to do is wash it. But that means clean, hot water and soap. Which becomes waste water, which needs to be treated, or least allowed to stew for awhile before it is released back into the environment. I don't like chopsticks, mostly because I have never taken the time to become proficient with them. I can use them, but it is a bit of a struggle, and I wonder, why bother? What's wrong with silverware? These days if I go to a Japanese restaurant, or anywhere else where chopsticks are the default eating utensil, I will ask for silverware. Japanese restaurants make me a little nervous because some of them appear to still use laquerware, which I imagine suffers from contact with silverware, but maybe it isn't laquerware at all, but a modern plastic substitute, in which case silverware is no threat at all. In any case, I try to go easy on it, which is no big deal, because I am proficient with silverware. Some restaurants give you plastic or imitation ivory chopsticks. Now I really wonder why that is. These have to be washed. Why not just use silverware? I suppose some people prefer it. For orientals, or people who grew up using chopsticks, I can see that there would be a preference. But I don't understand people who grew up using silverware preferring to use chopsticks. Well, maybe it you travel to the Orient a lot, it might come in handy. Me, I don't care for travel. And it's not just chopsticks, but look at all the little disposable items we use everyday. Since chopsticks are made of wood, lets look at some other wooden items. Toothpicks and pencils come to mind. How many acres of forest are cut down each year to make toothpicks, pencils and chopsticks? How many of those acres are replanted? Have you tried using one of the imitation wood pencils? They look like wood pencils, they sharpen like wood pencils, but they are flexible and as far as I am concerned, they are junk. I hate them, I think because they are flexible they do not offer the same degree of control, and control is critical if you are trying to do any detail work, either writing or drawing. I did a little research on the Internet about wood pencils. Making a wooden pencil is quite complex being as it has evolved over the last 100 years or so. They seem to have it down to a science. Mixing, baking, slicing, cutting, gluing, painting, crimping. A lot goes into making pencils. Of course this is only possible because they make billions of them every year. Once again, we have the same question, do we use the wood disposable item, or the more elaborate metal contraption, in this case the mechanical pencil? Mechanical pencils have the advantage of using no wood, and of using almost all of their lead. Wooden pencils often get thrown out when they are no more than half way used, and often sooner. With a mechanical pencil, it is only necessary to replace the lead when it runs out, so theoretically there is much less waste. I have one mechanical pencil I use occasionally, it uses a 0.9 mm diameter lead. The 0.7 mm lead is much more common, and there are some people who like pencils that use 0.5 mm lead. I am too heavy handed for the smaller leads. The .7 mm lead breaks repeatedly when I try and write something, and I can only use the .5 mm lead if I am very careful. The .9 mm lead works fine, that is, it does not break, but it does not give the same writing experience as a wooden pencil. The only problem with wooden pencils is that the erasers inevitably disappear before the pencil does. If I were a true American, I would throw them away when this happens, but I must be a Bolshevik, because I go to the office supply store and buy rubber eraser caps by the dozen. Not that it helps. I have four wooden pencils in my pencil can at the moment and none of them have enough eraser left to be worth mentioning. And then there are toothpicks. And matches, though most of them are cardboard now. But I think that is enough about this for now. Wesley Snipes at it again. Another action adventure. The lying young girl, Emily, was a novel touch. The super-secret CIA assassination squad is an old story, but in these times it continues to play well. What does that say about my faith in our government, when the bad guys in the movie are supposedly from our government? I did not quite understand why there would be strobe lights in the airport luggage handling area, but I suppose it is possible. Wesley's assigned partner was a little inept, and it got him killed. Is good help that hard to find? Perhaps it is. Tall buildings these days only have stairs because they are required by fire codes. If they were not required, I suspect many buildings would not have them at all. They consume floor space that could be otherwise be rented. But why has not anyone done anything about elevators? We will have a 50 story building with several elevator shafts that run all the way to top and each shaft is dedicated to one car. Imagine if streets were like that. One bus per lane all the way from Portland to Seattle. We need an elevator system with autonomous cars, that is elevator cars that can ascend or descend on their own without depending on cables, counterweights and rooftop machinery. Instead of having a bank of ten elevators a tall building could get by with two elevator shafts: one for cars going up and one for cars going down. Each shaft would hold five or so cars. When climbing cars reached the top, they would be shunted over to the downshaft. When the descending cars reached the bottom, they would be shunted back to the upshaft. They would in effect follow a circular pattern. I have no doubt that such an elevator could be designed and built and could be just as safe as our current elevators. Since floor space is at such a premium, and our current elevator system is so obviously inefficient, and a more efficient design could be built, the question is, why hasn't it been done? Okay, maybe it has, and I just haven't heard about it. In any case, what can be done? Well, it's political. Someone is going to have to champion the idea, sell it to some financial backers. And not only are there going to be expenses for development and testing, but a whole bunch of rules, regulations, and probably even some laws are going to need to be changed, and that is going to require a whole different skill set than that needed to design and build it. And then you have the insurance companies. Proving the safety of the elevator cars to the insurance industry is going to be strenuous ordeal. Finding someone who is willing to fight this battle on all fronts is going to be difficult. Let us leave aside the political and regulatory issues for the moment and return to how such an elevator system could be constructed. My favorite, and the most difficult technically, would be to use linear induction motors. The elevator shafts would have bus bars carrying electrical current. The cars would have linear motors that would react with the magnetic field generated by the current in the bus bars to propel the vehicle. The cars would derive their power by induction from the bus bars as well. Ascending cars would draw current from the system, and descending cars would push current into the system. No moving parts, a perfect system. But such technology may currently be beyond our capabilities. All cars would need some kind of fail-safe so in case of power or other equipment failure they would stop where they were and be locked into the shaft so they could not fall. This kind of mechanism is what made elevators successful in the first place. A technically easier method would be to equip each car with an electric motor, a speed reducer and a set of drive wheels. Like the previous idea, the elevator shaft would be equipped with bus bars running the entire length (height) of the shaft. The car would have brushes to pick up electrical current from the bus bars to drive the motors. All of the components for this kind of drive could be ordered from a standard industrial supply. To reduce the amount of current being carried by the bus bars, we could include a tow rope, something like what you find at a ski resort. When a car starts to ascend the motor would start turning the drive wheels. When the car reached the speed of the tow rope it could clamp on and the rope would haul the car up, almost to it's destination when the motor would come on line again, the car would release its' clamp and it would come to a smooth stop at the requested floor. The tow rope would operate continuously and would guided by two large wheels, one at the top and one at the bottom of the shaft, much like a ski lift. Of course you would need a sophisticated control system to dispatch the cars and keep them an adequate distance apart, but there are lots of smart people out there who could design such a system. The trick will be finding someone who can marshal the right people and deliver a correctly functioning, reliable system. Diebold is not it. I am sure there are companies that can do this, though it is very difficult to determine which companies are actually competent and which ones are just blowing smoke. I took the Mitsubishi into the dealer for service today. They gave us a free-oil-change-for-life deal when we bought the car. Normally I would not drive all the way to Beaverton just for an oil change, but there were a couple of other problems that needed attention, and then they sent me a free car wash coupon in the mail. So I took it in. The first problem was that something was rolling around loose and making a rattling noise. It started a few weeks ago, and it only happens occasionally, like on turns, but it is really annoying. It sounded like a screw had come loose inside the front passenger door. The other problem was a small scratch on the front bumper. That happened when we were getting ready for the garage sale. What was worse is that I tried to fix it. I left the car at the dealer for a couple of hours and when I came back it was ready. They had changed the oil and washed the car and found the source of the noise and fixed it. A nickel had fallen into the front passenger seat track and was rolling back and forth. All that was needed was a sharp pair of eyes, and maybe someone who had tracked this problem down before. They hadn't done anything about the scratch, but there was no charge for the rest of it, so I didn't complain, I just took the car and went home. I still want to get the scratch fixed, so I suppose I will have to go back. I always liked Mitsubishi. Their cars seem to be more engineering inclined. I have never liked Honda, or the higher priced Acura. I can't say why exactly, except that I think they are overpriced for what you get. Maybe it's the advertising that turns me off. Or maybe I just don't get it. In any case, I am repelled by Hondas. But somehow a nickel landed in the Mitsubishi's seat track. Was this just a fluke, or is it something about the design? Do Honda's ever have problems like this? Or maybe all cars have their little quirks, and this is just the Mitsubishi's weak spot. Watched "Equilibrium" (with Christian Bale) the other night. I was expecting something really bad, but it turned out to be pretty good. More and more I think the differences between a good movie and a bad movie are pretty small. Mostly it comes down to the good telling of a story. The story itself may be insignificant, but if it is well told, it is still enjoyable. Some movies get criticised for shoddy props, but if the audience is engaged in the story, the props don't really matter. Is the storyteller able to maintain a certain level of tension? If all the tension goes out of a story, the audience falls away, and all the great cinematography in the world can't save it. I am convinced that music can make or break a movie. Play sinister music and the pleasant scene in the world becomes fraught with risk. Play happy music and the darkest dungeons can become carefree playgrounds. I have often wondered if someone could take some of these box office disasters and edit them into something wonderful. Just pick and choose from the scenes that are already filmed and see if you could do a better job of telling the story. Recently I read a translators note about translating written Chinese to English. His idea was to absorb the ideas indicated by the pictographs, and then to render the English version to the best of his ability. While many people may be able to "read" and understand written Chinese, each persons translation of it will be different according to their abilities and the way they perceive the world. Likewise, different people given a batch of film clips, will arrange them in different ways to tell the same story. I wonder what I could do if given the opportunity. But back to the movie. I think this might be a pro-war film. The premise is that everyone takes a drug that suppresses strong emotions, it makes people more even tempered, and this prevents crime and war. All people are good little citizens, as defined by powers that be. Of course, the powers that be are totally corrupt, and not everyone is a good little citizen. Matter of fact there is a sizable police force devoted to tracking down and executing "sense" criminals, people who are not taking their emotion suppressing drugs, i.e. people who are enjoying life. These people make up a sizable underground, so naturally we have many gun battles. We also have something called "Gun Fu" which is the art of fighting with handguns. The elite few who have mastered this technique are nearly invincible. Great stuff. Reminds me China and Japan which enjoyed long periods of peace but suffered from stagnation. People often comment on how polite the Japanese and Chinese are, and I wonder if this is not an outgrowth of having eliminated all the troublesome members of their society. That is how they achieved peace and stagnation, they got rid of everyone who ever thought about making trouble. Contrary-wise, that is why America is so violent and dynamic. We have collected all the worlds troublemakers under one sky. Break OPEC. OPEC is a cartel, a very successful cartel. They have been able to keep the price of oil much, much higher than the production costs. I do not suggest this to bring the price of oil, and therefor the price of gasoline down, but rather to deprive our sworn enemies of the enormous stream of revenue that is flowing into their countries. There used to be a coffee cartel. JFK got it started in the early sixties. It flourished for a number of years, and it was the primary reason that your choice of coffee was Folger's or Maxwell House. This cartel finally collapsed about ten years ago, and now you have a plethora of coffees and coffee shops. Google found another article about JFK and the coffee cartel, but when I followed the link I found that access was restricted. If access is restricted, how does Google know the article is in there? Now that you have had your coffee, let us get back to the business at hand: OPEC and the Middle East. As long as I can remember, it seems that the Middle East has been in turmoil. You can point to any number of factors, the heat, the poverty, the arrogance of taking Arab land and giving it to the Jews (to found the state of Israel. Let's not argue about whether this was a good idea or not, my only point is that the Arabs have been complaining about it. ), American arrogance in our conduct of our foreign policy. But the real problem is we have been pouring enormous sums of money into the area, more than they have any idea of what to do with it. You have heard perhaps about the story about the solid gold camel saddle with 17 Rolex watches embedded in it? So what do you do about it? Stop sending them money. But they will cut off the oil you say. Right, as if they could. I doubt they would even know where the oil is, much less how to turn it off. The only people who do any actual work over there work for foreign corporations. Just do not send any more money. If they complain, first of all, deny. That should buy us a couple of months. When that runs dry, prevaricate: tell them the check's in the mail, there was some kind of foul up. With a skillful telling, that might last a year. When that story runs out, ask them what they are going to do about it? It might lead to war, but recent history has shown that in open warfare the Arabs can't fight their way out of a box. And in a year, they will have spent all their ready money. Yell boo, and the thieves will scurry off with their loot. I figured out how to set the posting date on my blog entries, so over the last few days I have been digging through some of my old email and posting them on my blog with the date they were originally written. Getting all my writings collected in one place has been a goal of mine for a while now. This blog is a convenient place to do it, and it promises to be semi-secure. However, I am dependent on Google to maintain this site and my blog, and I am not entirely comfortable with that. It might not be a big loss to the world if my blog disappeared, but it I would be upset. So, what to do? Well, my kids got me an external disk drive for my birthday, so I could download it and save it there. Kind of a nuisance, but that's what I get for being paranoid. Google did lose part of one of my entries, so I have some justification. I wish I could just trust them. Maybe someday I will. Only other problem I have is that I would like to be able to arrange the articles in chronological order. For a blog, reverse chronological order is fine (latest first), but for archives, I want to start with the oldest. Haven't figured out an easy way to do that yet. If we ever establish a base on the moon, we are going to need power, and for the projects I have in mind we are going to quite a bit of power. There are numerous ways to generate electricity: steam engines driving generators, nuclear power and solar power using solar cells are some of the ways we use. Solar cells are a popular method for inner solar system space exploration. There is lots of sunlight and solar cells do not weight very much, relative to the amount of power they generate. Nuclear power has been used for some satellites, though it has fallen out of favor due to environmental concerns. It is still a viable choice for unmanned deep space probes. Steam driven power generation is used on Earth because we have an atmosphere that supplies the oxygen needed for the fires under the boilers (steam generators in modern power plant lingo). Burning fossil fuels on the moon is probably not going to work because there is no atmosphere. There probably isn't any fossil fuel either, but you never know. The moon might be made of coal instead of green cheese. Of course, if we do find coal or oil on the moon, we are going to have to reconsider the appelation "fossil fuel". I do not like solar cells because they are exposed to all the hazards of space: radiation and impacts from micrometeorites. Because of this solar cells have a relatively short life span, ten years maybe in Earth orbit, considerably less on the moon. On the moon, you are outside of the protection provided by the Earth's magnetic fields. I prefer the idea of a steam driven generator set. Sunlight would be concentrated by mirrors and directed to a steam generator. The steam would drive a turbine which would in turn drive a generator. Very well understood technology here on Earth. The steam generator and the power plant would be located under ground for protection from radiation and meteors. Sunlight would be collected from a large bowl lined with mirrors and directed thru a tunnel, either horizontal or vertical, to the steam generator. I envision using robotic machines to do the excavation and some of the installation of this power plant. If we could devise a way to make flat surfaces from medium size rocks, they could be used for crude mirrors. The flatter they could be made, the better. Slate would be nice, but I doubt we will find any on the moon. They could even be spray painted with a metallic silver for better reflectivity. Anything we can build on the moon from materials we find there is mass we do not have to boost from Earth. Mylar mirrors would not have much mass, not much more than paint, but their life expectancy would not be that great. So I like rocks. Unless we build this power plant at one of the poles of the moon, it is going to be exposed to sunlight for two weeks and in darkness for two weeks. Building a power station at one of the poles that would be constantly exposed to the sun could be a bit of a trick, and that might not be the where we will need the power. So we should plan for two weeks of light and two weeks of darkness. One way to maintain power during times of darkness would be to have several power plants installed at different longitudes around the moon. Cables could be run to connect the plants, and so power would be available at all times all around the moon, at least at the same latitude as the power plants. Unfortunately, we would need thousands of miles of cables, and cables would have to be shipped from Earth, at least to begin with, and that would be expensive. Other ways would mean storing power someway. Batteries and flywheels are possibilities. Both are heavy. Using electricity to generate chemicals that could later be recombined (burned, perhaps) to generate energy is another way, though probably less efficient. And then there is always nuclear power, which has a whole slew of problems, but might on balance prove to be the simplest solution. In any case, I still like the idea of a solar driven steam generator. On Earth a day is only 24 hours long, so such an installation has to have a method of tracking the sun as it moves across the sky. On the moon, a day is two weeks long. You still need a method of tracking the sun, but it does not have to be quite so quick. So I imagine robotic machines going from one rock mirror to the next, giving each one a little tweak to adjust its' angle. By the time it gets done with each of the several hundred mirrors, it will be time to start over. When the sun goes down, it will make one last pass to repoint the mirrors toward where the sun will be when it comes up in two weeks, and then it can go to sleep until the sun comes up again. We watched The Good German (George Clooney and Cate Blanchett) the other night. Not bad. It was interesting seeing goody two shoes Spider Man (Toby McGuire) playing a slimeball. The story takes place in Berlin after the Allied victory over Germany, but before Japan was defeated. The Allies are meeting in Potsdam to carve up the spoils. The Russians want Eastern Europe. There are a couple of different groups from the U.S. One wants to prosecute all the Germans as war criminals. A second group is trying to locate all the scientists who worked on Germany's V-2 Rocket. Another group, which may be the same as the second group, or not, I am not sure, wants to locate any scientists who were working on Germany's atom bomb project. Nobody mentions this until the paper has news about the atom bomb being dropped on Japan. Anyway, some of the scientists are suspected war criminals, so we have two Allied groups competing to get ahold of these guys. Camp Dora was where the workers who made the V-2's were held. The V-2's were built in an underground complex. Workers were getting 800 calories a day. This was calculated as the most efficient use of resources. When they died of starvation, they were replaced. Evidently they had plenty of slave labor, but a real shortage of food. Anyway, we have plenty of intrigue with people trying to hide their past, people trying to get to the U.S. sector, avoiding the Russian sector. George gets beat up a lot. The plot is complicated. The movie is pretty good, except for the last scene. The last scene really looks a lot like the last scene from Casablanca, down to the hat. It didn't strike quite the right tone. Update April 2017. Added the picture. The movie was based on the book of the same name, written Joseph Kanon, who also wrote Leaving Berlin. Potsdam, I now know, is a suburb of Berlin (map). Elena and her Kawasaki Ninja. The most amazing website I have ever seen. Ross has taken an interest in records, yes, the big old vinyl platters that were made obsolete by CD's. And he isn't the only one. From the number of record albums I have seen for sale in the last few days it seems this old technology is enjoying a revival. Last week we stopped in at Everyday Music on Cedar Hills Boulevard in Beaverton. They had an entire room (2500 square feet) given over to vinyl records. When school was letting out for the summer, he picked up a turntable from someone who did not want to carry it home. It came with a preamp that allowed him to use it with his boom box stereo. But now he wants better speakers. My wife heard the name Paradigm from her hairdresser and a friend of Ross's recommended Fred's on Hawthorne boulevard so Sunday we drove over there to see what they had. I thought we were just looking. Silly me. Anne and Ross pick out a pair of speakers. I have been looking around the store while they were listening to speakers and now I think, well shoot, if Mom is buying him speakers, he's going to need an amp, and here is this gigantic Technics receiver (used) for $100 (here are some photos of a similar unit). We will just get that and he will be set, no more time wasted agonizing over (or shopping for) what amplifier to buy. That is worth $100 right there. Two doors down there is a record store, and wouldn't you know, they have vinyl. Well shoot, you can't bring home a new stereo without some new music, and this is what we had originally planned on, so we bought a couple of records. Recordings on vinyl. Old style. Jazz mostly. I have a couple of ideas on how airlocks might be improved. Both would remove more air more quickly than any current airlocks. Of course the only airlock we have right now is on the Space Shuttle, so the comparison is a bit unfair. They would add some complexity and mass, so the only place they would be useful would be where the air and time they saved would be worth the cost of boosting the extra material into space. Being as the cost of boosting the material is currently a couple of orders of magnitude greater than the cost of the material, we can neglect the cost of actually building these devices. The first device would use large plastic bags to force the air in the chamber out. The collapsed bags would line two opposing walls of a airlock. Inflated with air, they would meet in the middle and completely fill the chamber. To operate, a space suited person would stand in the middle of the chamber facing one of the bag lined walls with arms and legs spread. Evacuation of the chamber would begin. The bags would be inflated with perhaps double the current atmospheric pressure. This will encourage the air in the chamber to leave. When a satisfactory amount of air had been evacuated from the chamber, the pressure in the bags would be relieved, and the bags would drawn back to the walls by the means of straps attached to the insides and/or outsides of the bags. The bags would need to be made of a tough material to withstand the pressures involved. The tougher the bags, the higher the pressures could be and the quicker the airlock could be cycled. We would want to be careful not to exert too much pressure on the person in the lock, we would not want any crushing injuries. It would be nice if the bag could be made of a transparent material to alleviate any feelings of claustrophobia. The second device is simply a large diameter, long cylinder attached to the airlock. The cylinder would have about ten times the volume of the airlock. When the people entered the airlock, a piston in the cylinder would be next to the chamber. The other side of the piston would be vacuum. When the airlock was sealed, the piston would be released. The air in the chamber would expand and push the piston to the far end of the cylinder. The opening between the airlock and the cylinder would be sealed and the airlock could be opened to space. We would lose perhaps ten percent of the air with each cycle, but it would be very quick, a matter of seconds at most. Baring a breakthrough in physics, sending human beings anywhere in space beyond the moon is going to take a very long time. Even a trip to mars will take a year just to get there. Given this situation I think it would be a good idea if we got started with building a space habitat where we could learn how to live in space, not just survive. All the ideas I have seen about building a ship to go to Mars all look like they come from cheapskates. The bare minimum of equipment, the bare minimum of shielding, just enough that the crew, if they are lucky, will survive. It looks like a recipe for disaster. We should take a page from the Victorians and building something that could survive most anything the universe can dish out. Building a habitat at Lagrange point L4 (never mind L5, everyone else has already talked L5 to death) would give us a chance to see what it is really like to operate in space. To do all this may require several layers of various materials and in fact may be a hundred feet thick and honeycombed with access passages. One thing to remember is that we probably are not going to want much on the outside of the skin near the equator. The skin at the equator will be traveling at about 200 miles per hour. Anything that is attached there that loses its grip is going to leave very quickly. A large diameter cylinder would be fitted to the inside of the sphere and concentric with axis of spin. It would take up one third to one half of its' length. This would give us a large surface of even gravity on which which to house our people. A cylinder a third of a mile long and one mile in diameter would give us about one square mile of "land": 640 acres. We should be able to do something with this, perhaps farm, or even raise cows. The area between the cylinder and the skin of the sphere could be used for water tanks. In case of a breech of the hull, large valves could be opened into these tanks and quickly drain any surface water into the tanks before it all evaporated into space. Water in these tanks could also be transferred around the diameter of the sphere to compensate for any imbalance. Low gravity gradient. There would little difference in the apparent force of "gravity" as you changed elevation. For instance there would a negligible difference between your head and your feet, and the difference would still be small for an elevation change of 100 feet. Slow spin rate. I would hope that an angular velocity of one revolution per minute would minimize any problems with vertigo either for permanent residents or visitors. As far as I know there is no way to tell. Research and testing will be necessary. High linear velocity. The high linear speed of 200 MPH means that any motion in the vessel, like walking, will have a minimal effect on your perceived weight. Running, either with or against the rotation, will no doubt have a noticeable effect, though it should be something most people should be able to deal with. Wide open spaces. Having a "ceiling" a thousand feet in the air would give people a feeling of wide open spaces like they have on the Earth's surface. It might help prevent attacks of agoraphobia in people returning to Earth, and attacks of claustrophobia in people arriving at the habitat. Large volume of air. This means that we can survive small leaks until they are found and a small amount of anything unpleasant or noxious would be diluted to the point where it is harmless. contact with a long probe which would stabilise the vessel's position and relative velocity. We could have two kinds of berths. One would just hold the cage, and could provide an airlock for crew and passengers. The other could be enclosed so that it could be pressurized. A vessel a mile in diameter can expect to have a fair amount of traffic coming and going. Having this central cylinder devoted to docking would allow incoming vessels to enter at one end, be docked along the walls, and exit through the other end. 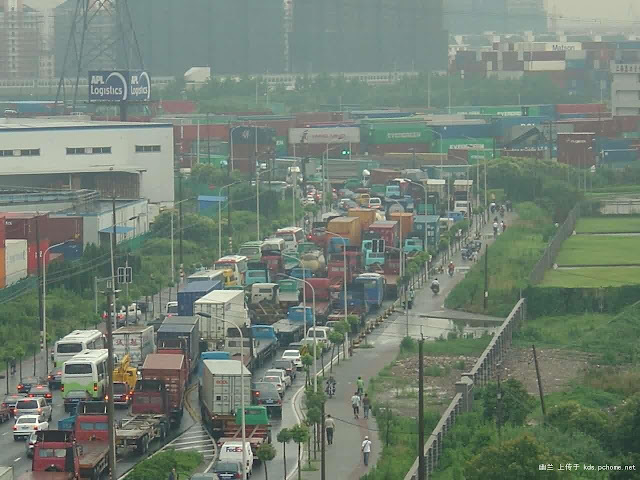 A continuous stream of traffic could beaccommodated this way. In most cases docking could be carried out in vacuum, but there will be cases where bringing the vessel into a pressurized chamber would make things easier. Emergency would be one case, and external repairs would be another. It is easier to build and seal a small door rather than a large door. If vessels where constructed as long cylinders, then they could enter a pressurized chamber through a relatively small door. So pressurized docking chambers would be cylinders perhaps three times the diameter of a vessel and slightly longer. We would probably not need to accommodate winged vessels like the space shuttle. We would be a long ways from anyplace where wings would be useful. The expense of boosting them this far out would be very hard to justify. However, if this structure is going to be a mile in diameter, just how big are the ships going to be? Right now I find it difficult to imagine anything larger than about 30 feet, but I have seen numerous engineering projects that had to be revised to accommodate the bigger, larger and more powerful. At one point I was thinking that sand would be the perfect material to use for shielding the outer skin of the sphere. Easy to transfer, simply pour from one container to another. Good for absorbing impacts from micrometeorites and cosmic rays. And it could be used as a raw material. Apply enough heat and you get oxygen and silicon. Oxygen is always handy for air breathing mammals. Problem is any small holes in the "underside" of the containing vessel would let the sand drain out and be lost. There are ways to compensate, like putting a chamber below the sand to catch any that leaks out, and allow maintenance to plug whatever holes show up in the floor of the sand chamber. This is from an email exchange with my brothers. Well, it's slightly more interesting than that. I guess I could title it "Anecdotes Of the Business Cycle and International Logistics." So our company is at the end of the 2nd quarter, and we have a big order shipping out to a customer. The bosses are frantic and hysterical to get the revenue booked in Q2. The rules say we can't book revenue until the product ships from the factory; more specifically, until we get a signed Forwarder Cargo Receipt from the forwarder. Now we introduce a development from the world of international trade regulation. Apparently there goes into effect on July 1 a reduction in "duty drawbacks." My understanding is, if a US importer pays duty on an import, then takes that item and re-exports it (or something made from it), they can recover a lot of that duty. After July 1st, they can recover less. 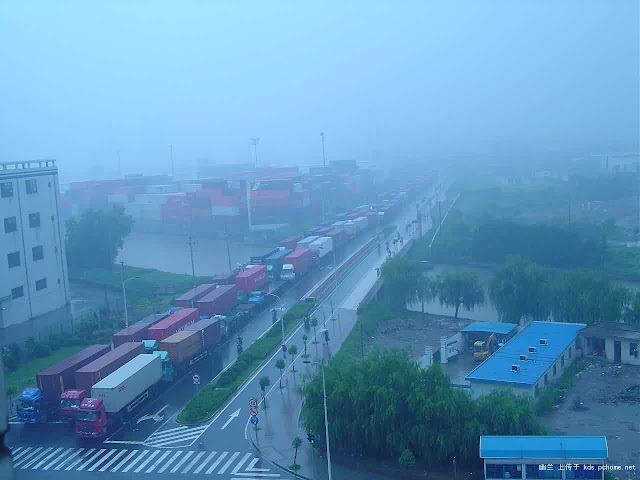 Thus, all the buyers are pressuring the Chinese manufacturers to ship by June 30 to secure the higher duty drawback rate. 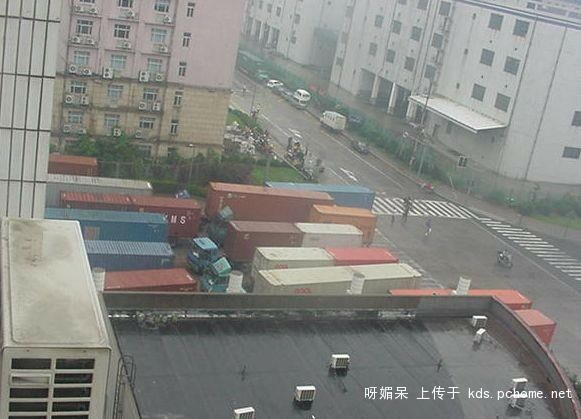 Thus, Chinese logistics are in gridlock. Thus, our $500K of mouse pads can't get to the forwarder, we can't get the receipt, and we can't book the revenue. 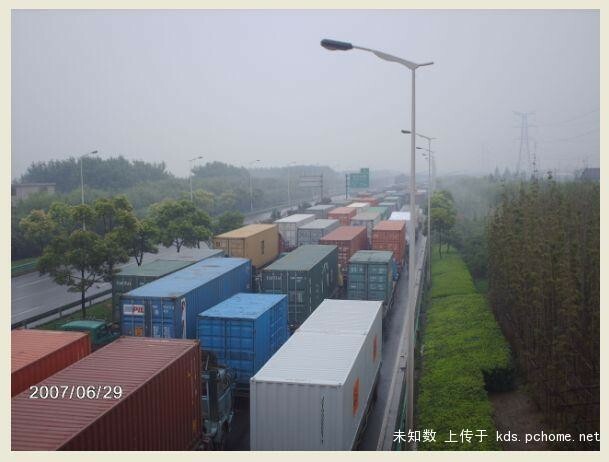 Our agent in Malaysia sent us pictures taken by the forwarder in Shanghai to document the traffic situation. Not particularly interesting in and of themselves, but interesting for me to see what's behind my personal torment. Incidentally, my tongue-in-cheek comment on the situation was "we'll just book it next week." They looked at me with slack-jawed incomprehension. Why is there such activity over there when I am finding it hard to find meaningful productive work here? China & North Korea's success. How do these countries with limited infrastructure grow so quickly? The US preserved from the disruptions of war & famine has accumulated vast pools of cash (rich). Technology has enabled the delivery of quality products, regardless of geography. Seeking low price the US buys from the cheapest producers. Why should this bother me? The rich sharing with the poor. Years of xenophobic fueled propaganda of the inferiority of other nations and their peoples and the selfish (but logical) desire to invest in my community. What assurance do we have that this is not harming our interests? Do the common citizens of these other countries enjoy life as much as we? Net cash outflow, sort of like what I am experiencing. I bought a book by George Soros a few months ago called "On Globalization". I have not read it yet. According to sailboat people (cruisers) America has the best and cheapest food. All the new semiconductor fabrication facilities (fabs) are being built in SE Asia at a cost $2 billion and up, each. Similar facilities are required to make LCD flat panel displays. When they built fabs here, it was a big deal, people blabbing about how many jobs they would provide. By my estimate, the cost of the fab was about equal to the gross wages paid to the entire workforce for the next 20 years. I doubt the fab will last that long. I imagine that to stay competitive, all the equipment will need to be replaced within five years, and that is at least half of the cost of the fab. So building these fabs in Asia might be saving them a few percent on manufacturing costs, but I doubt it even reaches ten percent. Still, that could amount to 100 million dollars, which is still a considerable amount. Nike (also headquartered here) was lambasted in the press for running sweat shops in SE Asia. What the protesters didn't say was that for every person working there, there were three or four more wanting the job. On PBS last night there was a talking head saying that real wages in America are at the same level they were in 1974. Worker productivity has doubled. We have been running a trade deficit with Japan for years, ten? twenty? I don't know how long. Salaryman gets ground to dust. US is trying to get China to adjust their exchange rate. China is holding it artificially low. Not sure what this is all about. Keeping the populace down, keeping the commies in power? We bought a Japanese SUV in January. Consumer Reports OK'd it. But you look at American SUV's, and they haven't changed in ten years. Update March 2016 replaced missing pictures.